Over the last five years, we have seen many domestic flooring manufacturers onshore and foreign manufacturers establish production on U.S. soil. This has happened across many product categories, primarily hard surface: the establishment of LVT production facilities began in 2013 and the wave of ceramic production facilities in 2014, with construction of plants to produce rigid LVT underway now. While the idea of U.S. manufacturing appeals to patriotism, the drive toward domestic production is based on the fact that it’s good business for the manufacturer, the supply chain, the end-user, and the economies, large and small, that it exists within. Yet, in the broadest of terms, American manufacturing is a complex subject. Even individuals actively producing in the U.S.-and promoting U.S. production-will also hold that blindly onshoring all flooring production is not feasible or necessarily desirable. And, to be clear, we’re far from that point. Right now, in spite of all the establishment of new factories across the States, over 40% of flooring sold in the U.S. market, by dollar value, is imported. 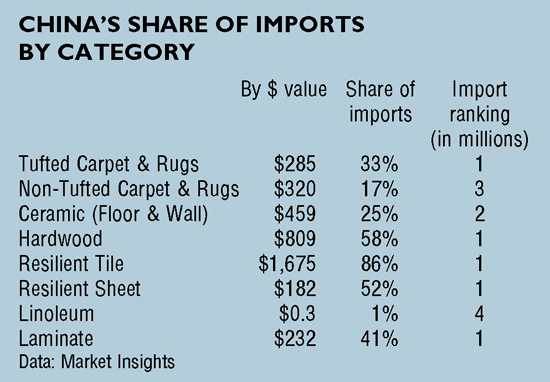 And, considering that a significant amount of imported flooring is at the commodity end of the market, that amounts to a hefty square footage. These factors are significant in enabling domestic manufacturers to confidently and competently serve their customers, which is, of course, the central goal of every business. Says Don Maier, CEO of Armstrong Flooring, which manufacturers a wide range of hard surface flooring products on U.S. soil, “Manufacturing in North America, where the bulk of our flooring is sold, gives us greater product control, improved lead times and the ability to more rapidly integrate customer feedback into the product design and development cycle. Domestic manufacturing puts us in close proximity to raw materials.” Armstrong Flooring has 12 production facilities across the U.S., manufacturing LVT, resilient sheet, VCT and hardwood. As F. Scott Fitzgerald said, “The test of a first-rate intelligence is the ability to hold two opposed ideas in mind at the same time and still retain the ability to function,” and nowhere is that concept more applicable than with regard to localism and globalism. Because, of course, there are also good arguments to be made for letting specialists-be they domestic or far-flung-do what they do. In an ideal world, we’d consume what was produced at close range-by the local butcher, baker and candlestick maker. But how should those principles be applied to highly manufactured, technical products? Is local always better? Do we want to rely on our neighbors-our literal neighbors-to make our cell phones? Our cars? Our computers? Does Phil next door seem up to the task of establishing a secure, reliable 4G network for your community? And are you willing to assume that, in some way, his network will be inherently better because it was made by local hands? To step back a bit, we must acknowledge that the concept of American-made itself can be a bit amorphous. One shade of grey within the domestic manufacturing discussion is ownership. Just because a company is producing on U.S. soil doesn’t mean it’s based here, so while local economies may be supported by a facility rooted domestically, profits may be going elsewhere. Complete Flooring Supply Corporation (CFS), for instance, just announced that it is investing $30 million to build its first U.S. manufacturing facility in Gordon County, Georgia; the company is headquartered in Shanghai and has Chinese ownership. Additionally, there are a host of already-established U.S. plants that are foreign-owned, including Tarkett, Nox, American Wonder and Landmark. In addition, three of the top five domestic ceramic producers are foreign firms: Panaria’s Florida Tile, along with Florim and Fiandre’s StonePeak. Secondly, manufacturing is a multilayered process, and the production of a final product domestically doesn’t guarantee that all the components and chemistries were manufactured within the country’s bounds as well. To carry a Made in the USA mark, “all or virtually all” of the product must be U.S. made, according to the Federal Trade Commission, which regulates the label. Interestingly, at the Made in America Store, located in Elma, New York-a retail location dedicated to carrying only products of which every component is U.S.-made, including packaging, a standard higher than the Federal Trade Commission’s-owner Mark Andol has struggled to fill his shelves and, notably, not a single item in the store requires a battery or plug, according to the Chicago Tribune. Carpet and hardwood-especially solid hardwood-production have long been rooted in the U.S. And with laminate in stasis, the current movement toward U.S. production primarily focuses on two flooring categories-ceramic and LVT, including rigid LVT like WPC and SPC. The history of these categories in the U.S. market varies greatly. While ceramic has never had the marketshare in the U.S. it enjoys in other parts of the world, it has long had a strong foothold in the U.S., particularly in bathrooms, kitchens and a range of utilitarian commercial environments. And many manufacturers and importers of the category believe there is share to be taken from other categories here, especially as the market mentality has shifted from soft to hard surface, not to mention the leaps and bounds made with regard to ceramic tile aesthetics, due to digital printing and new formats. LVT has seen its star rise more rapidly. The category is gobbling up share. Last year, it propelled resilient to be the fastest growing product category with a 16.3% increase. It is also evolving quickly and significantly in terms of its construction and composition. Responding to high end-user demand, we see manufacturers establishing resilient production in the States. Currently, the top five-Shaw, Armstrong, Mohawk, Mannington and Tarkett-have plants already operating or under construction in Ringgold, Georgia; Lancaster, Pennsylvania; Stillwater, Oklahoma; Dalton, Georgia; Madison, Georgia; Kankakee, Illinois and Florence, Alabama. How that will ultimately shape up is yet to be determined. At this point in time, the demand for LVT is so strong that the domestic production capacity represents less than half of what’s consumed. The network of LVT’s manufacturing is much different from that of carpet, which has a centralized hub of production, a system that arguably leads to a more sophisticated industry and output than scattered production. Northwest Georgia is the undisputed leader in carpet worldwide. Sure, there are companies in other regions making carpet, but having consolidated expertise creates a more sophisticated market than scattered expertise. A consolidated market means that its primary suppliers are likely close at hand, as we see with the proximity of tufting machinery makers-like Card-Monroe and Tuftco-to the carpet industry. These organizations aren’t just shipping machinery from across the ocean to serve their clients, they’re walking onto the factory floors to discuss the successes and challenges of the machinery as the industry develops new processes and products. A consolidated market means that material resources are, to some degree, shared-fiber and chemical suppliers, for instance, increasing the industry’s importance with those suppliers. It also means that personnel, through the normal course of employment, transition easily from one organization to another, creating a stronger and more knowledgeable workforce that, while competitive, is also friendly and, to a degree, unified. As the industry considers the next steps in onshoring production of multilayered flooring, how might it best position itself to establish what could be the next Dalton, Georgia? Where is the expertise? Where are the material resources? And will the U.S. vertically integrate the full process or leave components to overseas sourcing? Needless to say, the success of the give-and-take economy relies on an even playing field, and that, too, is a subject of endless grey area-and a subject at the forefront of many minds right now due to the proposed tariff’s on Chinese-made products, including flooring. In 2017, $9.078 billion dollars of flooring (landed duty value) hit U.S. shores, an 8.5% increase from the year before. This means that imports accounted for 40.1% of the U.S. market, which totaled $22.262 billion last year, according to Market Insights. The largest increase among the flooring categories was, unsurprisingly, in resilient, with a 27.7% increase over 2016. And, within the resilient category, resilient tile, which includes LVT and its cousin products, led with a 32.6% year-over-year increase. 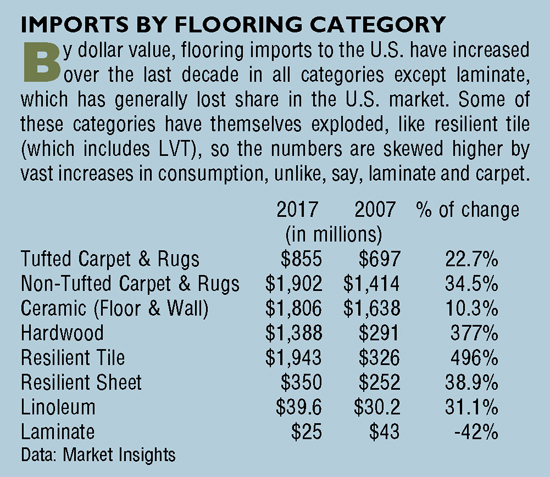 It is interesting to note that, per the Imports by Flooring Category chart, over the last decade imports (by dollar value) have risen in all categories except laminate, with hardwood and resilient tile experiencing dramatic increases. And while laminate has lost share generally within the U.S., it also seems pertinent that Lumber Liquidator’s formaldehyde scandal involved Chinese-made laminate, which reached the public via 60 Minutes in March 2015. However, China remains the largest importer of the laminate to the U.S. market. All that said, it is somewhat surprising to see that, in spite of all the activity within the industry to establish onshore manufacturing, such a significant chunk is still arriving on a ship. With the inclusion of flooring in the Trump administration’s proposed list of tariffed Chinese imports-a decision on which will be finalized August 18-that landscape could potentially change, though U.S. manufacturing is not yet poised to take over a substantial amount of LVT/WPC production. Regarding the issue, the industry seems to be divided to a degree, with some feeling that the tariffs will create more of an equal opportunity market between domestic-made and Chinese-made products, and others, reliant on imports, uniting in opposition to the action-as a group of vinyl industry representatives, including Shaw, Novalis, CFL, Metroflor, the American Chemistry Council and the Vinyl Institute have done-appealing to the Office of the United States Trade Representative against implementation of the tariffs. For both consumers and A&D, American-made without doubt generates a host of warm feelings, and with good historical reason-in 1932, manufacturing employed almost a third of Americans (32%), according to the Bureau of Labor Statistics. By 2015, that number had dropped to 9%. In spite of that drop-or perhaps because of it-American-made carries significant weight with a certain type of American consumer. Don’t we all have an uncle, for instance, who will only buy American cars? Interestingly, however, with regard to flooring, this commitment is purely conceptual-it’s not easier to install, clean or fix a U.S.-made floor; it’s not inherently more comfortable underfoot or more beautiful. Except in extreme circumstances, existing on an American-made floor doesn’t significantly improve quality of life, though it might put the mind at ease-and, as we all know, mental comfort is as important as physical comfort, if not more so. Paul Stringer, vice president of sales and marketing for Somerset, reports, “Hardly a week goes by that a potential customer does not call to confirm that Somerset’s products are made in the USA. They usually cite reasons like, ‘I want to buy from a company that I can contact directly,’ ‘I don’t want to support jobs overseas; I want to support jobs in the U.S.,’ or even ‘I don’t trust how products are made overseas.’” Somerset manufactures 100% of what it sells in the U.S. today; a decade ago, it imported around 5% of its volume. Even so, most of the manufacturers with whom we spoke aren’t sure that U.S. consumers will pay more for domestically made product. Instead, they generally agree that it is one consideration among many. James Lesslie, executive vice president of sales and marketing for Engineered Floors, notes, “All soft floorcovering is pretty much made in the U.S., so U.S.-made is not much of a differentiator there. Effectively, the vast majority of hard surface is imported. Unfortunately, I don’t see that this factor is-as with cars-at the forefront of people’s minds.” Lesslie reports that establishing Engineered Floors’ carpet production in the U.S. market was essentially a no brainer, considering owner Bob Shaw’s roots in the Dalton, Georgia community and his experience in manufacturing in the area. The company, which launched from zero in 2010, now employs 4,000 in northwest Georgia. The central benefits of U.S. manufacturing listed by the experts with whom we spoke are often virtually invisible to those ultimately choosing product, but they do help determine what products ultimately make it to the showroom floor or architecture folder. It’s the supply chain that makes these critical decisions and servicing them well is a key focus for manufacturers. Michel Vermette, Lape’s counterpart at Mohawk Commercial, contends that domestic production provides leverage through limiting risk and errors. “There is a higher service level with U.S. manufacturing,” he adds. “You can respond quickly. Your controls are in your backyard, and you can execute quickly. The right hand and the left hand are more coordinated. With importing, there are more variables to be controlled.” When Mohawk ramps up its multilayered flooring production next year, it expects its LVT offering will be 50% imported and 50% domestic. Finkell agrees that service is the crux of keeping production close to the market, “There are some great overseas manufacturers today, so it’s not as much about quality as it once was, but about service. Every company makes mistakes and ships products that are imperfect. When that happens with us, it’s a whole different ballgame than it is with product shipped from China. Our mistakes are easier to fix and less painful for the supply chain. That’s a big part of why people, in some cases, are willing to pay a little more for locally made. Our lead times are two to four weeks or in stock. By using a domestic supplier, distributors have less money on the water. In addition, we can respond to demand much faster and are a better predictor of trends.” Finkell’s father, Don Finkell, started American OEM in 2015; the company’s product is manufactured in Tennessee, using prison labor. Neil Poland, president of Mullican, points out that doing the right thing isn’t just good business but peace of mind as well. “Control is the most beneficial aspect of U.S.-based manufacturing from my perspective,” he says. “You know there is no child slavery, no illegal logging, no massive abuse of the environment or employee exposure to highly toxic substances. For all those reasons, you can sleep better at night if you manufacture here. You can do due diligence and site visits in sourcing from Asia, but there is still some risk.” A decade ago, Mullican imported all of its engineered flooring; today, it imports less than 10%. We have seen-in only the last few years-a tide change with regard to ceramic manufacturing. For a long time, Crossville and StonePeak were the only ceramic manufacturers in Tennessee, but Dal-Tile, Landmark (where Atlas Concorde produces), American Wonder, Del Conca and Florim have all now established production in the region, where there is ample raw material supply and, to a degree, established efficiencies. Interestingly, this hasn’t as of yet moved the needle too significantly with regard to ceramic import rates, which are still sitting at around 60%, but experts in the field believe that the U.S. market for tile is expanding, and these U.S.-based manufacturers are poised to capitalize on that expansion. Long an importer to the U.S., Italy-based Atlas Concorde began U.S. production at a new factory owned by Landmark Ceramics, a sister company, in late 2016. Today, the company has two brands: its imported Atlas Concorde brand and its domestically manufactured Landmark brand, which are about equal in size here. The company’s drive to create U.S. production was based on improving its level of service and lead time, while the price point for best sellers and segmentation motives played a role as well. There is no doubt about the power a factory has to change a community. We’ve seen it across the historical beds of manufacturing in America-particularly the South and the Rust Belt-bringing prosperity when in operation and economic devastation when they close their doors. Of course, much has changed since the days when human hands were completing every detail of production. Automation has reduced the number of workers it takes to manufacture products, so does manufacturing still bring substantial benefit to the communities in which it’s embedded today? Yes, because, a factory is not an island. Mark Clayton, CEO of Phenix, points to Dalton as an example of the sort of prosperity that business can bring a town. He notes, “You have a town that was built to support the industry, and the industry supports the community through infrastructure, utilities, healthcare, churches and activities.” Phenix makes residential carpet in company-owned, U.S.-based manufacturing facilities and sources hard surface flooring. One of its sourced LVT products is assembled in the U.S. via a joint venture. The company sought a U.S. partner in this endeavor to both support American manufacturing and to optimize the service cycle. Consumers often assume that U.S.-made will take a bigger chunk from their bank account, but is that actually the case with flooring? In some cases, yes, American workers demand a higher wage. That and other factors can push the price tag on U.S.-made a bit higher-but not always and, in other cases, not by as much as many assume. Often, whether or not domestic product can compete price-wise with imported product depends on the level. At the commodity end, U.S. manufacturers struggle more. In many cases, Americans simply can’t produce low-end products as cheaply as Asian producers can. But in the mid- and higher levels, prices even out. Ed Duncan, president of Mannington Residential, points to job creation as the most satisfying aspect of domestic manufacturing for Mannington. “As a company, knowing that we are providing jobs is extremely satisfying,” says Duncan. “Jobs help families thrive, which in turn helps communities grow.” Mannington produces nearly all of its flooring products on U.S. soil, including sheet vinyl, laminate, carpet, rubber and commercial LVT. A decade ago, 100% of its LVT line was imported. Another important aspect to consider is that factory jobs today are often at a higher level than they once were, as the automation necessitates the hiring of mechanics, engineers and technicians, rather than primarily line assembly workers. Floor Focus has covered the subject of rising freight costs frequently over the past year or so. Federal Motor Carrier Safety Administration Hours of Service regulations limit the length of time a truck driver can drive consecutively and dictate the numbers of hours drivers must rest between periods of working. This, and rising fuel costs, have driven the cost of transportation up and ultimately support the act of manufacturing close to the market.